If you think pool construction stops in winter, you would be wrong. 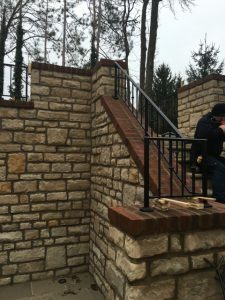 Our crews work year-round building, installing and creating amazing outdoor living spaces for our clients. These photos were taken just a few weeks ago, during a bone-chilling January cold and snow storm. 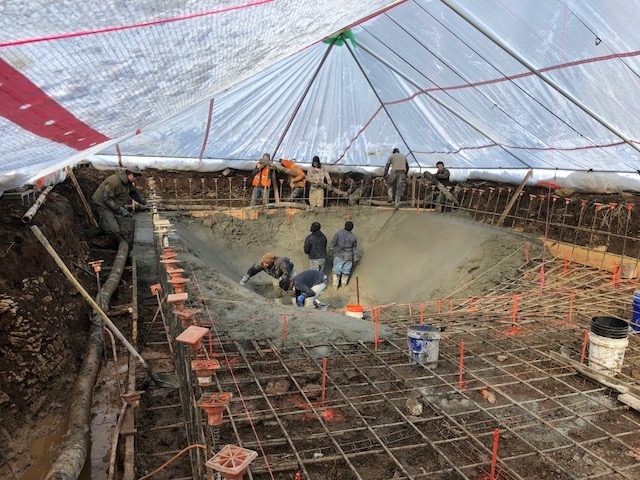 Tenting covers the entire work area, heaters are brought it to keep the area a toasty 85º, and crews pour concrete over support rebar. 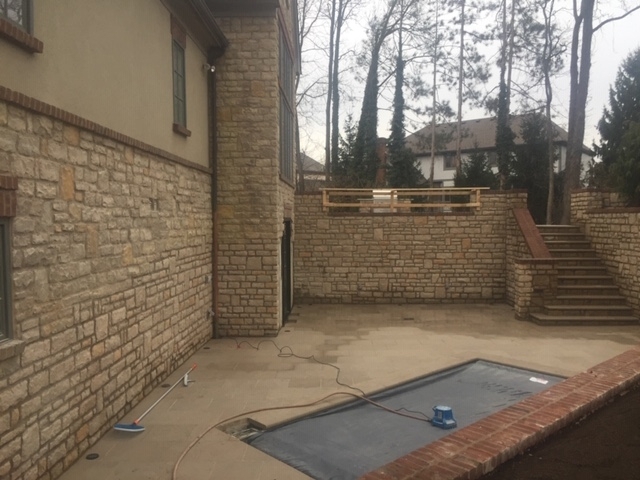 About that rebar, Landfare Ltd. uses more than industry standards require – we work off a 12′ grid – in order to better reinforce the structure and ensure a beautiful concrete surface. The sound of falling or bubbling water can help us relax, stay calm and focus on the beauty of nature. Your water feature should reflect the mood you want to create and your lifestyle. Landfare Ltd. custom designs and builds each water feature to enhance the outdoor living spaces we create for clients. Materials vary based on the overall outdoor living environment and the design choices that support your preferences. Each feature is perfectly incorporated into the ambiance we are creating. The variety of water features is unlimited. 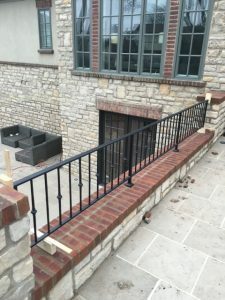 See some of our recent projects here. Front porches and patios offer wonderful opportunities to display containers filled with plants and flowers. At Landfare Ltd, each element must support the overall property designer. 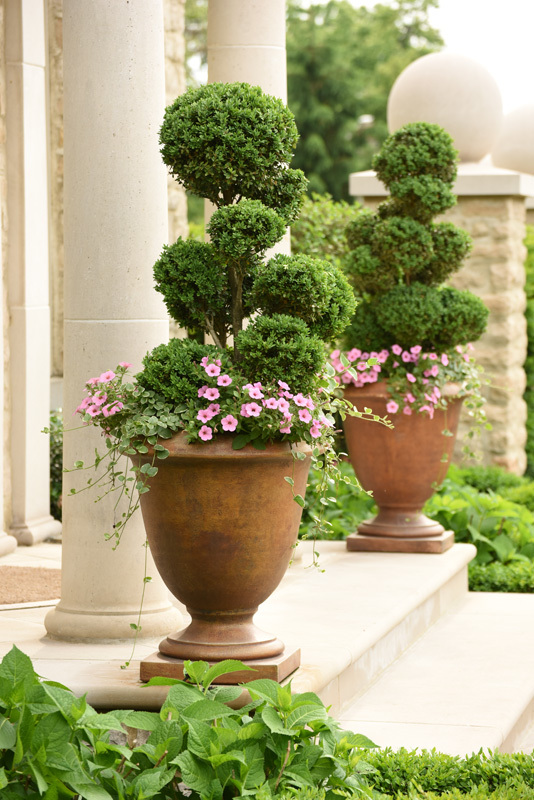 These Italian urns are the perfect contrast this French country home’s limestone porch and steps. The featured boxwoods are 28 years old, trained and trimmed to perfection – not a random choice at all!. Seasonal flowers and greenery work with foliage and blooms throughout the property. 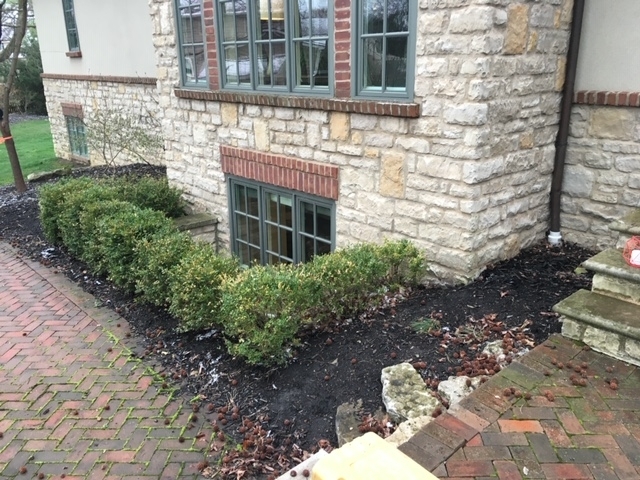 It is all of these details that bring the best out in your landscape. 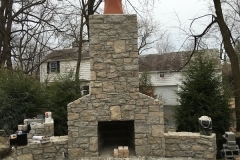 Our client is looking forward to entertaining family and friends this summer. 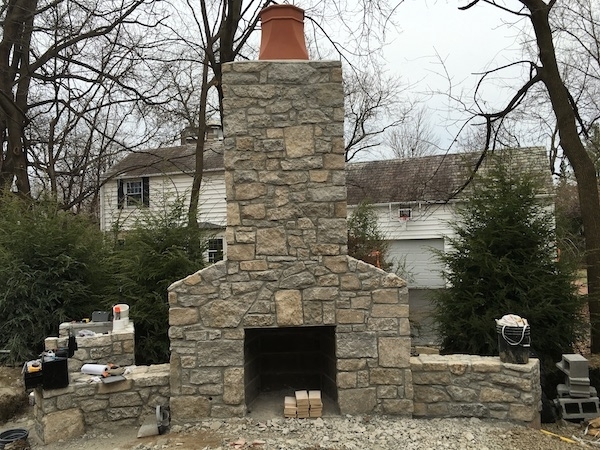 Landfare Ltd. is building a fireplace and swimming pool as part of the outdoor living space we have designed for their home. Thought you may want to see some “behind the scenes” photos. We’ll show the completed project shots soon. We never stop working, no matter the season! 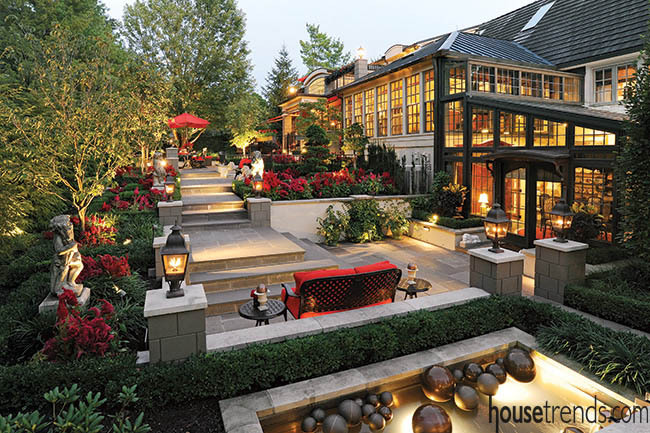 Our clients, residents of Upper Arlington, Ohio, love traveling, entertaining and their chateau inspired home. 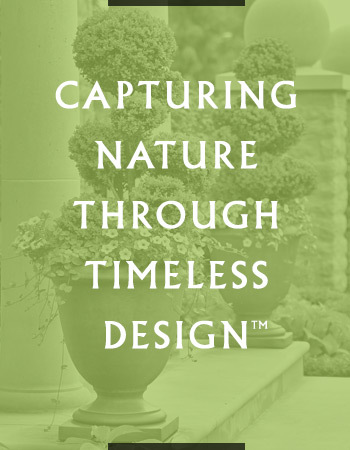 Recently featured in Housetrends Magazine, the complete landscape design created by John Spayde, Landfare Ltd. principle and designer, offers multiple terraces, entertaining spaces, custom water features and French-style parterre gardens. 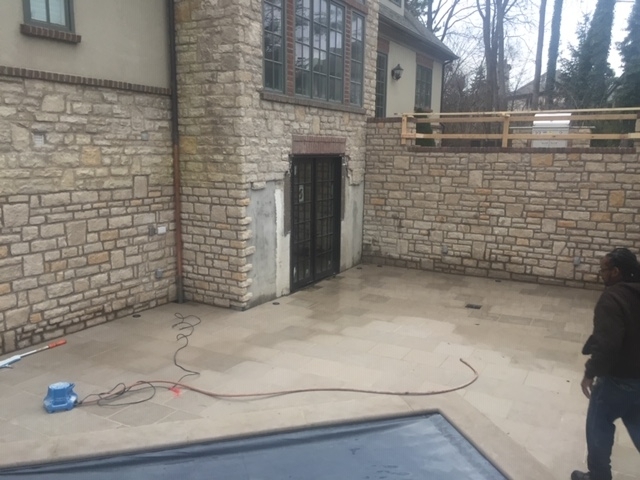 The homeowners are thrilled that we took their nice backyard to an exceptional outdoor living environment where they can entertain their family and friends. See more photos and read the article on this remarkable project here.